This post will guide you how to use Excel SUBSTITUTE function with syntax and examples in Microsoft excel. The Excel SUBSTITUTE function replaces a new text string for an old text string in a text string. The SUBSTITUTE function is a build-in function in Microsoft Excel and it is categorized as a Text Function. The SUBSTITUTE function is available in Excel 2016, Excel 2013, Excel 2010, Excel 2007, Excel 2003, Excel XP, Excel 2000, Excel 2011 for Mac. Text -This is a required argument. The text string that containing the old text to be substituted with new text string. Old_text – This is a required argument. The substring that you want to replace. New_text – This is a required argument. The new substring to replace Old_text substring with. Instance_num – This is an optional argument. The number value will specify which occurrence of old substring you want to replace with new substring. Note: If Instance_num value is omitted, every occurrence of old substring will be replaced with new substring. 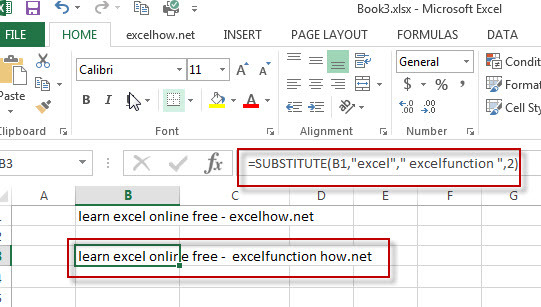 The below examples will show you how to use Excel SUBSTITUTE Text function to replace old substring with a new substring. 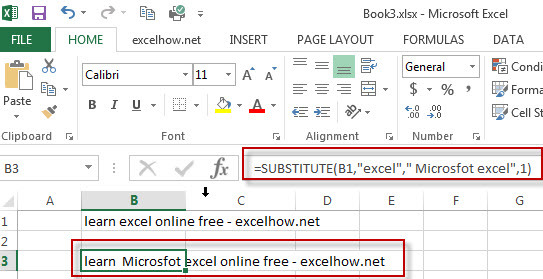 #1 To substitute first instance of “excel”old text string with a new text string “Microsfot excel” in B1 cell, just using formula=SUBSTITUTE(B1,”excel”,” Microsfot excel”,1). #2 To substitute second instance of “excel”old text string with a new text string “excelfunction” in B1 cell, just using formula: =SUBSTITUTE(B1,”excel”,” excelfunction “,2). If you want to sort the list by word count in excel, you need to create an excel formula based on the LEN function and the SUBSTITUTE function……. If you have a list of data (B1:B4) that contain the text string and each word is separated by comma character. And you want to replace the last comma character with a new word “and”.You need to create a new complex formula based on the SUBSTITUTE function, and the LEN function to achieve the result…….. If you want to insert a file path and filename into a cell in your current worksheet, you can use the CELL function to create a formual…….. If you want to remove all dash characters in one cell in Excel, you can use a formula based on the SUBSTITUTE function……..